Late last year I met up with some old friends in Paris and attended a cooking class led by the delightful Paule Caillat at Promenades Gourmandes. It was an unforgettable experience and I think fondly of Paule every time we make one of her delicious dishes. In fact, we have now served her recipe for Magret de Canard with Sauce Bordelaise to so many friends that we have lost count. The star of her recipe is absolutely the bordelaise sauce (which is the best I have ever had) but we also found the technique for pan searing duck breasts to be a revelation, who knew it was so easy! This week’s French Fridays with Dorie recipe, Twenty Minute Honey Glazed Duck Breasts, features the same technique for cooking the duck, but is paired with a quick and easy honey-balsamic pan sauce. As someone who has now put this technique to good use on multiple occasions, may I just say that it is brilliant and really easy. If done correctly, the skin comes out crispy and delicious and the meat juicy and tender. Then, it’s just a matter of deciding how you want to dress it up, and Dorie’s simple pan sauce (see her full recipe here in d’Artagnan) is perfect for when you need to get dinner on the table quickly and with minimal fuss. The all important technique calls for the fatty duck skin to be scored into a crosshatch pattern without cutting the meat; this is important because if you cut into the meat the juices will escape during cooking and your duck may end up dry. The breasts are then seasoned with salt and pepper and cooked, skin side down first, in a very hot skillet. Note that, as with bacon, there is no need to add any butter or oil to the pan because the duck has enough fat to saute itself. A couple minutes on each side, then a short stint in the oven, and voila! Perfectly cooked every time. Just one word of warning here, this is one of those recipes which will make you appreciate your splatter screen (or make you wish you had one) because all that duck fat can get a bit messy. It may also test the batteries in your smoke detector. But please do not let that deter you, because if you like duck, this is a great way to cook it. This entry was posted in french fridays with dorie and tagged Around my French Table, poultry, technique. Bookmark the permalink. The rice & greens look like perfect sides to this dish. Your duck looks simply perfect! Great post! That came out beautiful! I want to eat it NOW! Hmmmm…I’ll have to lock Charlie in a closet or something when I make this (joking, joking). He thinks the splatter screens are irresistable toys. He digs through my cabinet just to find them, then runs around the house holding them up to his face. I’ll have to figure out a way to keep him from spotting them when I make this. Your meal turned out beautifully – great job! I just loved this one too. I was definitely thankful for that splatter screen. Your sides look great. Is that barley and broccoli rabe? Gorgeous! Why thank you. That was actually meant to be brown rice pilaf, but I didn’t have enough brown rice and had to add barley to make up the difference. And my other side is spinach. LOLm fire alarm was tested and in good working order! Your sear on the duck looks fabulous!! What is the rice dish you served with the duck? It looks as enticing as the juicy pink meat! Thanks! It’s my trusty brown rice pilaf recipe, made with dried cranberries and walnuts. I’ll try to post the recipe soon. Your meal looks delicious! As dumb as it sounds, I didn’t know why we shouldn’t score the meat til I read your post. Doesn’t sound dumb at all. The only reason I knew the reason for not scoring the meat was because I took that cooking class. I contemplated the purchase of the splatter screen before I made this, but I couldn’t take another trip to the store. A little messier than I would have liked, but totally worth it! Great post. How wonderful to have that cooking class in Paris and the background in this technique. I am forever grateful for learning such an easy way to make a dish I love. I used the dutch oven, which saved my kitchen! I think that’s one of the things I enjoyed about fixing this recipe is that it didn’t require any extra fat because of cooking it skin-side down. This was just an incredible tasting meal and I am glad you enjoyed it as well. Yours looks beautiful. Mmmmmm looks delicious and I can imagine how good those balsamic sauce on the honey glazed duck breast. I regretted giving this a miss coz the pultry seller insisted that I take home the whole duck which Wild Boar and I can’t finished if I were to buy back a whole duck. Never thought of using chicken breast until I saw our Dorista friend substituted the duck breast with a chicken breast ! 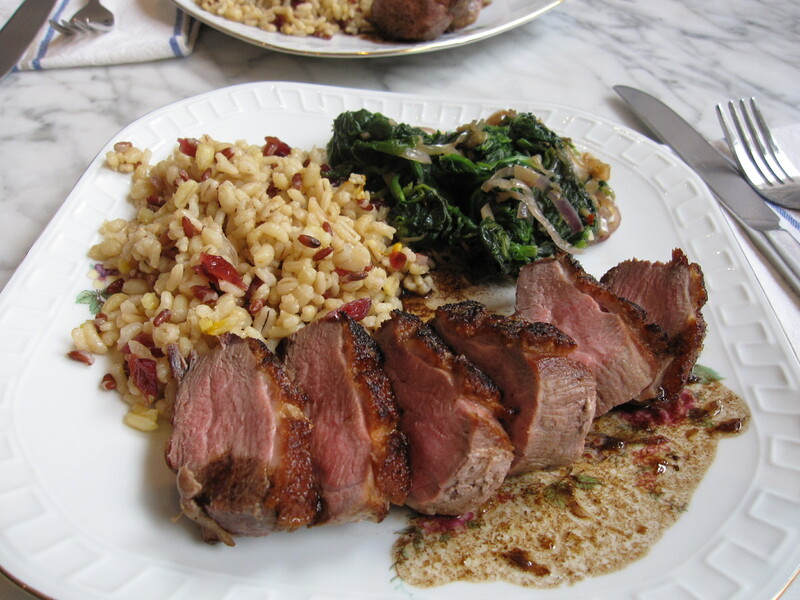 But I shall try this for sure after seeing this mouth watering honey glazed duck breast. Thanks for sharing such a delicious meal…I am hungrrry now :))) Have a nice day ! it so much. Speaking of Lydia, Tricia and I are going to her book signing this coming week. The cooking class was a very special experience and I am so happy to have had the chance. And that’s really interesting that Lydia is from Istria, I have only seen her show a few times before and just assumed she came from Italy. Have fun at her book signing, that should be fun. Your meal looks wonderful! I enjoyed this one too. What a delicious plate!! It is so beautiful…and perfect sides for your duck 🙂 Hope you’re having a nice weekend! What a gorgeous looking dinner! Your duck looks fabulous! Can’t wait to give this one a try! I’m just jealous that you were in Paris AND attended a cooking class! As a first time duck cook I was surprise how much fat was rendered in cooking. Your whole meal looks wonderful!